Living in Chicago, we endure extremely cold winters, but all seems right in the world once summer rolls around and the foods of the season become our focus for those few glorious months. 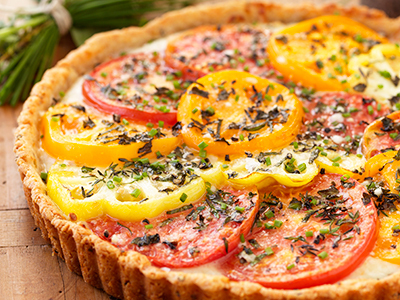 Heirloom tomatoes are the culinary highlight of summer for me, and I wait until they are perfectly ripe to make this scrumptious heirloom tomato tart. Red, yellow, green, and purple; I love to combine all the colors and varieties for a beautiful showstopping presentation. From Get Your Bake On. With the addition of cheese, herbs, arugula, or even prosciutto or sliced ham, this tart is extremely versatile and can be served as a side dish for an elegant dinner or as a meal on its own. I like to pair this tart with a nice crisp glass of Chardonnay—in fact, I actually submitted this recipe to my favorite vineyard and they featured it on their blog. I was incredibly proud! Preheat the oven to 350°F and place the rack in the center. In the bowl of a food processor, combine the all-purpose flour, whole wheat flour, a pinch of salt, a pinch of pepper, and the Pecorino and pulse to combine. Add the butter and pulse until the mixture resembles coarse meal, then slowly add 3 tablespoons of the ice water until the dough comes together to form a ball. If the dough is too dry, add more water, 1 teaspoon at a time, until the desired consistency is reached. Press the dough into a 9-inch tart pan and refrigerate for 20 minutes. Prick holes all over the bottom and up the sides of the chilled crust with a fork, then line it with parchment paper and fill it with pie weights. Blind bake for about 20 minutes, then remove the weights and parchment paper and continue to bake for about 10 minutes more, until golden. Remove from the oven and set on a wire rack to cool completely. To assemble the tart, arrange the provolone and mozzarella cheeses evenly over the bottom of the cooled tart crust, then layer the tomatoes on top in a circular pattern. Season with the thyme, basil, oregano, and Parmesan and drizzle with olive oil. Bake until the cheese has melted and the tomatoes are soft, 20 to 25 minutes. Remove from the oven and season with fresh chives and salt and pepper to taste.